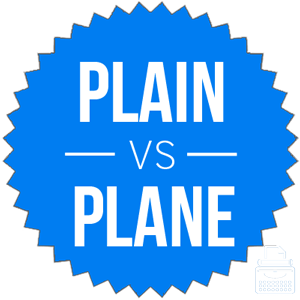 Plain or Plane – What’s the Difference? Home » Plain or Plane – What’s the Difference? When two words are homophones, they have similar pronunciations but different meanings. Plane and plain are two English homophones, which would be confusing enough, but each of them also has a meaning that refers to a flat area. What’s a poor writer to do? As tricky as these words can be, there is an easy way to remember the difference between them. What is the Difference Between Plain and Plane? In this post, I will compare plane vs. plain. I will use each of these words in at least one example sentence, so you can see them in context. Plus, I will use a helpful memory tool that you can also employ to make choosing plane or plain a little easier. What does plain mean? Plain can be an adjective or a noun. As an adjective, plain means featureless or unremarkable. Plain ice cream has no toppings or extra ingredients, such as fudge or strawberries. Plain pizza is just cheese with no pepperonis, sausage, green peppers, or anything else. Something that is just plain stupid is stupid with no mitigating factors or other explanations. Children often enjoy plain cheese pizza, but as they age, they enjoy pizza with a variety of delicious toppings. If you want to be an extra in the music video, please wear a brightly-colored, plain shirt with no text or graphics. As a noun, a plain is a geographical feature characterized by a flat landscape and short vegetation, if any. The central United States is renowned for its rolling, grassy plains. A floodplain is a flat, low-lying area near a river that often floods during wet seasons. A herd of wild horses used to live on the plains beyond the outskirts of town. Beyond the plains, a mountain range dominated the horizon for miles in every direction. Any passengers who have not boarded the plane prior to takeoff will not be able to board. Planes crisscrossed the sky above the airport. In order to solve the equation, you must define two points on the horizontal plane. Each surface of a perfect cube represents a two-dimensional plane. Plain and plane can be confusing, especially since each word can sometimes describe a flat area. Plane describes a flat area in geometry. Since plane and geometry each contain the letter E, keeping them straight should not be that difficult. Is it plain or plane? Plane and plain are homophones. Plane is a noun that means a flying vehicle or a geometric concept. Plain can be an adjective, where it means featureless or unremarkable, or a noun, where it means a flat area of land. 1 What is the Difference Between Plain and Plane? Humor or Humour – What’s the Difference? Homogenous vs. Homogeneous – What’s the Difference?